A champion for the blind and low vision population of Montana was lost on Sunday, April 7th, with the passing of Donna McCulloch. Donna spent most of her life helping the medical needs of others as an RN and later as a mentor and advocate for the blind. Born in Lewistown, Montana on December 11, 1946, her first years were spent on a ranch near Roy. She later moved to White Sulphur Springs and to Belgrade in her elementary years, finally moving to Bozeman for her teen-age years. 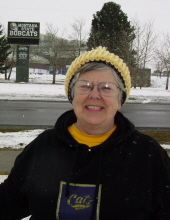 She graduated from Bozeman High School in 1965 and Montana State in 1969 with a degree in nursing. She finally married Ken McCulloch, her boyfriend for five years, in 1968. They had two children...Aaron and Nikki. She spent most of her working years in Boise, Idaho where Donna initially worked in geriatric nursing and eventually taught LPNs at Boise State University, winning many awards for her work in the teaching profession. In her middle age years her diabetes began to take its course and she began to lose her sight and kidney function. No one should have to put up with the numerous health challenges and multiple surgeries she had, but she battled her afflictions with determination and an ever-positive outlook, helped by her Christian faith and fighting spirit. In 2004, Donna and Ken retired to their hometown of Bozeman where Donna became involved with the local blind organization and was quickly elected president. She organized several amazing programs for the blind and low vision of the Bozeman community, which are still active today. She also volunteered with the crisis center making calls for shut-ins. She is survived by her husband Ken, son Aaron (Danielle) McCulloch of Boise, daughter Nikki (Brian) Scott of Bozeman, a brother Lawrence (Jean) Edwards of Silverton, Oregon and two grandchildren...Griffin and Drake McCulloch of Boise. She has been cremated. Services are scheduled for E-Free Church on April 27th at 11:00 a.m. and a symbolic scattering of the ashes will later be held at the Emmett, Idaho cemetery where her parents, Henry and Nora Edwards and brother William are buried. Memorials can be sent to the Bozeman Low Vision Center, %Bozeman Chapter Montana Association for the Blind, PO Box 6797, Bozeman, MT 59771 or the charity of their choice. To send flowers or a remembrance gift to the family of Donna Lorraine (Edwards) McCulloch, please visit our Tribute Store. Guaranteed delivery before Donna's service begins. "Email Address" would like to share the life celebration of Donna Lorraine (Edwards) McCulloch. Click on the "link" to go to share a favorite memory or leave a condolence message for the family.